When chatting with my Facebook friends, I’ve recently noticed the word “Seen” and a small checkmark next to the message I sent. What does it mean? This is indeed a new Facebook feature, which I also only recently discovered. After you send a message to your friend, Facebook tries to guess if your friend saw the message and let you know by displaying “Seen”. But how can Facebook know whether your friend saw the message? 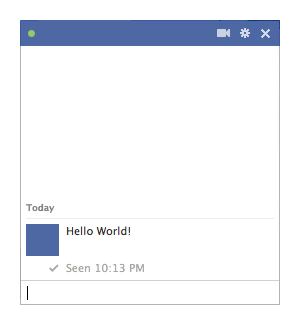 I ran a small experiment, and here’s what I found: If your friend has been active on the computer (moving the mouse, using the keyboard) and the Facebook chat window is visible on his/her screen, then Facebook infers that the message was likely seen by your friend. In that case, Facebook will display the “Seen” label in your chat box, along with a timestamp. This, of course, works both ways (you are “Seen” by your friend), which means that it is harder for you to ignore your Facebook friend by pretending you never saw his/her message! Some might find that this new feature invades their privacy, since they don’t want others to know when they are in front of the computer. The bad news is that there is currently no way to disable this “Seen” feature. Facebook users should not be surprised! It is not the first time (and probably not the last) that Facebook adds or changes features that affect users’ privacy without letting them know. While Facebook and Twitter currently dominate social networking in Bhutan, here are a few other services worth checking out. LinkedIn (www.linkedin.com) The largest professional social networking site, where people connect with colleagues, upload their resume, search for jobs, interact in professional discussion, etc. There are now quite a few Bhutanese users on LinkedIn. Google+ (plus.google.com) With more than 170,000,000 users, Google’s social network is still lagging behind Facebook, but some find it easier to use and with better privacy management. Pinterest (www.pinterest.com) is a fast-growing photo-sharing social networking site, where users manage collections of images based on their interests.